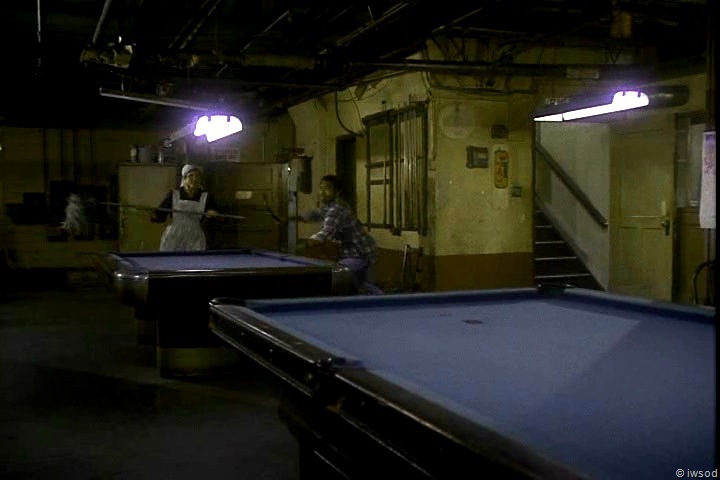 10/11 Season Two, Episode 11:Three Faces of Emily-Scarecrow and Mrs King | "Just walk with me.."
Amanda heads down the stairs into the seedy pool hall.. to find the two soldiers waiting.. Amanda gives the two men the code word: ‘silver lining’? How ironic..
Did the baddie Garrison, just call Amanda ‘sweet cheeks’ ? Aie!!Ewww.. he’s going to keep Amanda company while Sykes calls the bank to make sure their money has been deposited..
As Sykes waits for his call to be put through, we see Garrison menacingly move closer to Amanda.. What a creep! Poor Amanda!!! The only thing more gross is Sinclair in Brunettes ( ) – This has a shade of Brunettes creepiness to me.. Amanda gives him a quick glance as if to say ugh! I have to deal with a sleeze!!!! ( You hear the saxophone in the background?? ) Amanda is trying to be brave.. and keep smiling.. Poor Brave Amanda! Poor Amanda. Her fear here is very real IMHO. That guy needs be die slooooow and painfully!!! Awful!! Does that guy bite her shoulder? or just kiss it? Ugh!! 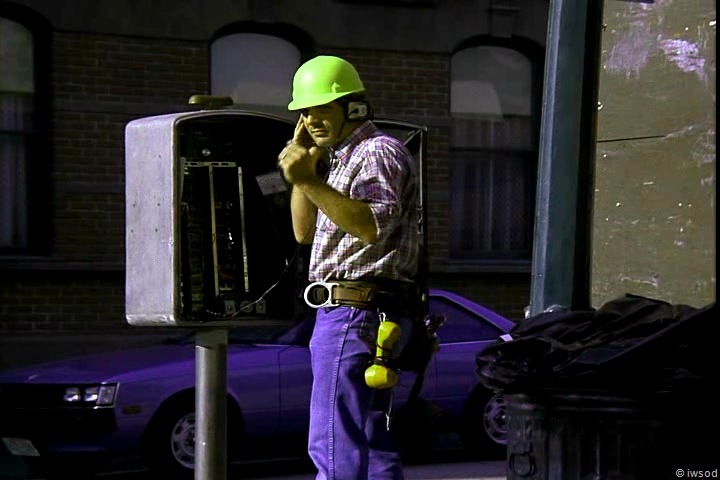 Outside, Lee has gotten the thumbs up from Bob the Builder that the call has been made..LOL.. Lee’s thumb looks huge! haaaa! Ahhh here we have Mademoiselle Francine at the bank service desk! What’s with the hair bow? Trop Mignon! 😉 She looks about 10 years old! ha! The nail polish and remover on her desk looks a bit random: there is a part in the script where they have her paint her nails while making Sykes wait while he thinks she is looking up his account – but it was cut.. so now it just looks like she always keeps nail polish on her desk.. soooo professional! Not.. I would have thought Francine would keep things more professional than that.. oh well. She has a sweet French accent! As Francine makes the baddies wait.. there is a little suspense here- at least there is for me!- We see the baddie is now blowing in Amanda’s ear.. Poor Amanda –she jumps in fear, though she smiles on the outside..- I think she is putting on a brave face here too: these guys are killers and she just wants out of there without upsetting them!!!! Has anyone read this scene in the script? Do you think it reads as trying to be at all funny during this scene? There is a mention of Amanda showing a terrified expression, and that Amanda is defenseless in the presence of the two soldiers, and hypnotised by the gun pointing at her.. and a mention of Garrison learing.. but no mention of kissing/ biting her shoulder, blowing in her ear, or ( upcoming) wretching her arm behind her back- I think it was originally intended to be suspenseful only – but then the comedy was added in.. I think they should have stuck with the script! What does everyone think? or anyone read the script?? tell us what you think of the script maybe?? As Francine ‘checks’ the account balance.. Garrison leans in closer to Amanda telling her: You’re a fine lookin gal. Amanda responds: ( with a fake smile) thank you so much. In the script Amanda says : ‘Uh, Thank you’ I suspect KJ has embelished on this.. I think this is what Amanda says when she doesn’t mean thank you at all. I heard that this expression is a southern thing- in a commentary from the TV show ‘The Closer’ ?? Brenda says ‘Thank you so much’ alot also- and it means the opposite of Thank you! Of Course, I am no expert on Southern etiquette.. Can someone shed some light on this for us?? Francine at the magical make believe bank of Switzerland tells Sykes the money is in his account.. and he is fooled. Suffer! 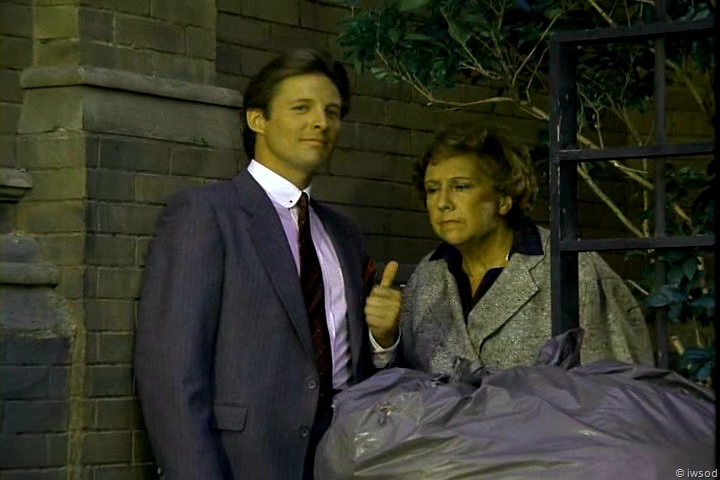 Sykes hangs up, happy to have his money, he walks over to Garrison and tells him to hand over the film to Amanda. Garrison exhales, disappointed his little sick game with Amanda must end.. creep! Help?! I don’t get why they had to meet Amanda to get the code word: they don’t give the code word to the bank.. and they already know the account number and account code..
Didn’t the baddies give Whatsit the account details in that message they wrote with the negotiation demand?? (and gave to Amanda at Wilson’s) ?? So why did they have to wait till Amanda arrived and gave them the code word for them to then call the bank and check their balance? Help?? The baddies could have checked the bank balance hours before and just never met up with her! It’s all very weird! And Garrison says to Amanda they don’t trust Whatsit because ‘maybe he just sends the codes and then no money shows up in Switzerland.’ -when did Whatsit send bank codes? I’m lost! Whatsit’s going on?????!!! IMHO it’s very brave of Amanda to speak up here! She really is my hero in this scene! Sykes grabs Amanda by the arms forcefully and lifts her up.. the pressure’s getting to him.. Take your hands off Amanda!! Sykes: I thought I told you to shut up. might not be a good idea to double-cross the Russians…. They’re Russian. Amanda has been in there too long [I’ll say!]. Lee and Emily worry.. and start to make arrangements to go in there. EH??? why weren’t they already set to go straight in???!!!!!! They should have had eyes or ears in there too.This being outside thing is too dangerous.. Interesting! 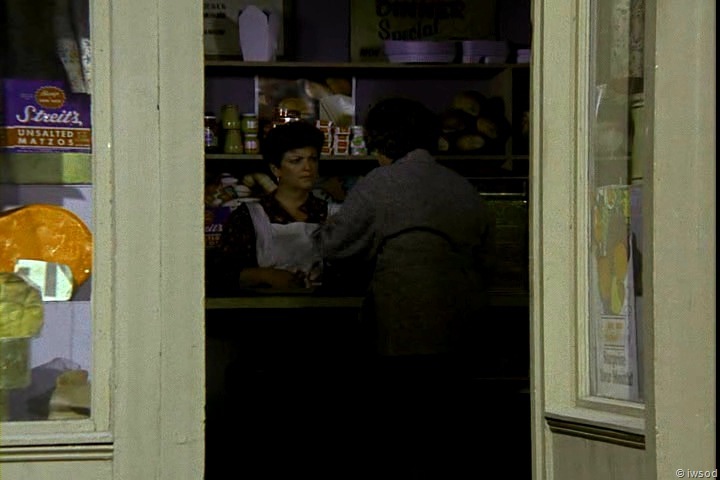 I never noticed this before, when Emily begins to talk to the lady in the deli- for just a second, we see the lady begin to untie her apron before the shot cuts back to Lee- the apron Emily ends up wearing. That’s new for me! Thinking: – ohhhhh nooo!!.. Just give them the code word, take the film and get out of there?? I should have known- Things never work out so easily with the agency!!!! They’re gonna kill me!!!! This is no game.. Amanda’s lucky she isn’t killed before Lee and Emily arrive. They take a big risk here..
Sykes: Great, you’re right. They’ll never find us. What about Whatsit? Garrison: We cut our connection with him, right here. Both baddies look at Amanda. eek..
Sykes: You mean I kill her? 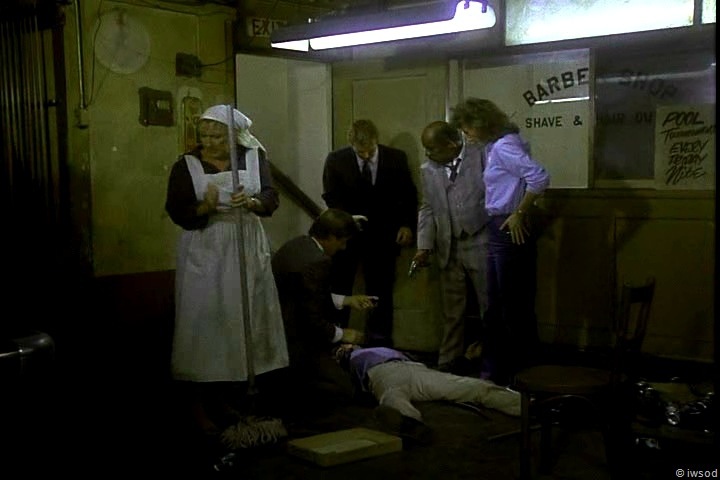 Okay- how can Lee send Amanda into this situation with two killers to collect a film? .. but in Brunettes are In, Remember he tells Billy: Lee: ah Billy, she’ll be out there without any kind of back up. She’ll be totally alone! and he tells Amanda when she is accepting her assignment in Brunettes: Lee: but Amanda this is not what you are use to! You’ll be alone. We can’t afford to arouse suspicions by having our back up agents nearby. Lee didn’t want Amanda to go into the local Laundromat, surrounded by others to collect a precious microdot?? Okay, they are waiting outside the pool hall- but that is not ‘ nearby’!!! that won’t stop a bullet! 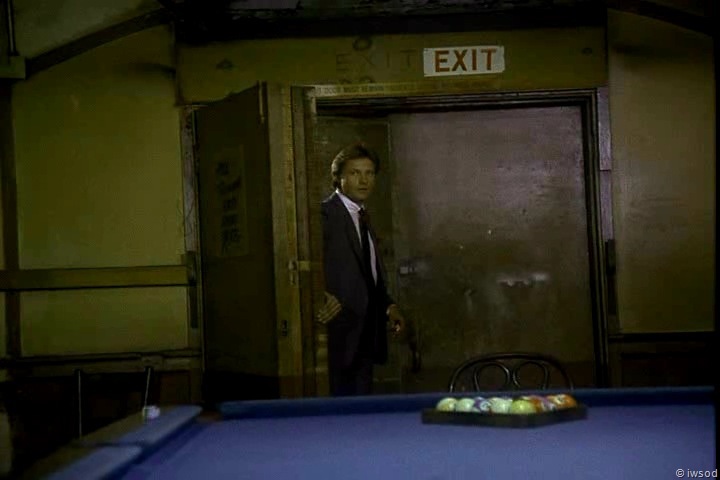 I find this situation scarier..[even with their so called ‘back up’ ] these guys are killers.. and.. they are in a secluded, closed pool hall- alone!!!! ??? with no witnesses!! [Including Lee and Emily! ] Maybe this experience freaks Lee out: and this explains why he acts as he does in Brunettes?? I find it weird.. They really were about to kill Amanda when.. clunk clunk… we hear Emily the cleaning lady arrive and Sykes walks over to ask her to leave.. I guess being a cleaning lady meant she didn’t just automatically get shot.. and it gave a chance for Lee to get in through the back door..
Man, he is IMHO being pretty violent/aggressive with her: [You guessed it- it’s not in the script] this is not the usual smk violence- and I can’t think of another time when Amanda gets grabbed like that: I don’t like it!!!! I don’t watch smk for gritty realism! I’m glad this is a rare thing..
Emily makes her move: hitting Sykes with her mop, knocking his gun out of his hand and Lee smashes Garrison with a chair – hooray: hope it hurt!! Lee yells to Amanda to get out of the way and cue the action theme! 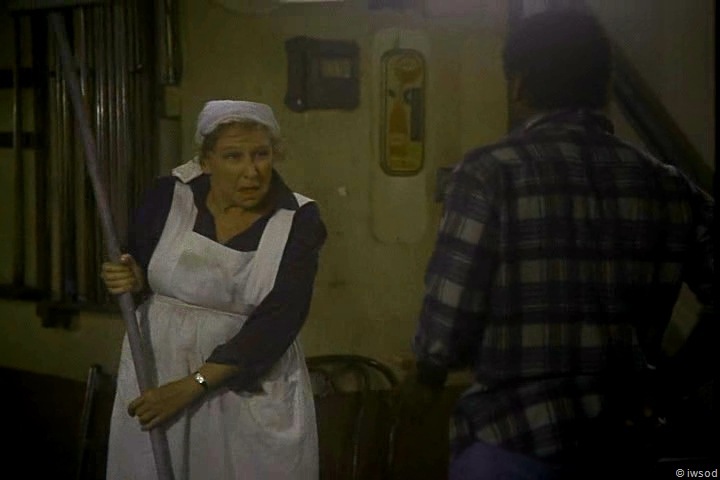 My my.. that agile cleaning lady we see in the distance beating the crap out of Sykes? – it’s gotta be a stunt Emily! Yup we also see Stunt Lee.. and Stunt Garrison.. (with much shorter hair..) rahh rah.. Amanda grabs an orange billiard ball and throws it into Skyes’ back- ouch! Yes, it seems Sykes had randomly decided to jump onto the pool/snooker/billiard table (take your pick!) to turn around and attack Amanda on the other side of the room!! Ohhhh SMK!!! I love it!!! Love how Garrison, running up the stairs gets whacked with the small stick Lee threw across the room — and obediently falls down the stairs! ha haaa!! Mark this episode ladies- Lee’s hair actually got mussed up in a fight! Rofl!! Me like!! Lee holds up the film canister declaring: Falcon Wing. They have the photos of Falcon Ving!!.. Yippeee.. I shall finish up there for now! Hope you are all well! Thanks so much for stopping by and reading: as always it would be great to hear your thoughts byeeee and back with more soon! I’m pretty sure stunt Emily is not only 30 years younger but also male! They really didn’t try that hard to make the stunt doubles very convincing, did they? As for Francine’s hairbow, that’s another classic early-mid80s fashion accessory. Very early Madonna! rofl. Yep love those male stunt doubles.. I kinda miss seeing them now we are up to the start of season 4 – it’s been a while. Yeah I remember Madonna having those bows! Being from Arkansas I can tell you that the term “Thank you so much” is usualy said with a fake smile and delivered very syrupy and condescending…after all we will be southern polite …that is how we were raised…. Thanks Gruvy Granny!!! I just keep hearing Brenda Leigh Johnson! I didn’t realise Amanda’s “thank you so much” was a southern thing, I just assumed it was sarcasm dressed up to sound polite. Her poor expression when Garrison is kissing her shoulder 😦 I can’t believe Lee and Emly let her go down into a basement where they don’t even have any level of line of sight. Kinda makes a mockery of Lee and all his other speeches about Amanda being in danger. Sloppy work IMO. I do enjoy Francines foray into fake accents, she actually seems to do a good job here. 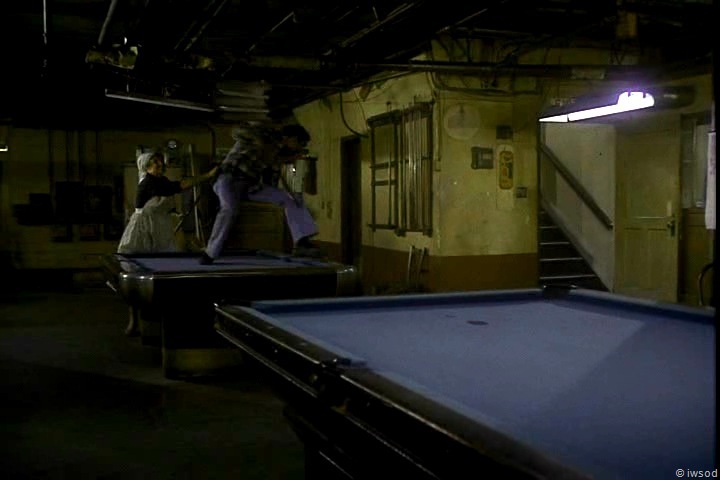 Too funny about the billiard ball, when she throws it I always wince, that’s gotta hurt. Am liking Lee and his mussed up hair. Kinda makes up for the lack of concern about Amanda being OK.
Well, as a transplanted girl from South Florida who has Yankee parents, now all living in the middle of the Deep South (rural Georgia) I’ve come across some funny stuff about Southern Speech! Hi guys! I’ve really enjoyed all your thoughts on southern foibles! Who would have thought I could have picked up that little bit of trivia from Brenda Leigh Johnson! 🙂 I miss that show!!! I thought more people liked the pool scene – I didn’t realise there was a number of us that didn’t like it!! True Raffie.. fair’s fair.. Francine gets to do over the top coquette french girl! There has to be some kind of explanation for that hairbow- why not this one of yours Raffie?! I like it! yeah I wondered if the actor thought: whoo I get to bite KJ’s shoulder? what a day at work! 😉 but.. too intense.. too creepy! eek..
I’m no expert on Southern foibles, but I know it is *very common* for Southerners to wrap an insult or sarcasm in syrupy sweet language. They are experts in euphemisms! And gossip or criticism can always be prefaced or concluded with “Bless his/her heart” to make it perfectly acceptable. “Bless his heart, the man must not own a bar of soap!” Hyperbole is huge too in Southern speak. And Kristen, I completely agree that Amanda has been raised to be polite and so will try to respond politely, even if not sincerely, to everyone. I also find this pool scene creepy, and it definitely makes me think of Brunettes, unfortunately. 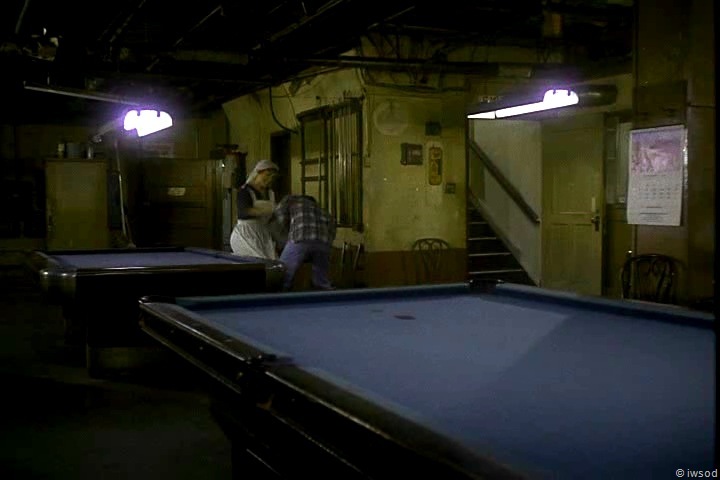 Something random that always strikes me in the pool hall scene is Amanda’s throwing arm! I know KJ was heavy into tennis, and it shows as Amanda sends the ball sailing with great form. We see this same good form in Dancing Weasel. I’m always very impressed. Seriously! And finally, another randomness…. My youngest was born in ’93 and he had big chubby cheeks when he was a baby, so I called him “sweet cheeks”. (I know, ugh… but I only called him that in private, lol.) It wasn’t until I started rewatching SMK a couple years ago that I realized where I got the name from. I thought I’d sorta just made it up. Ah, the staying power and subtle influences of SMK! I love when you point out all of the “prop incontinuities” and other bloopers…cracks me up. Having only old memories and fuzzy VHS tapes to go on I’ve not noticed half of the things you do. 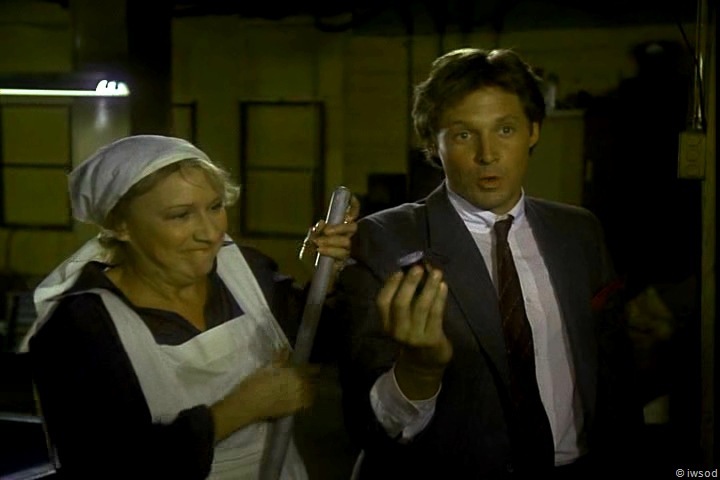 Now, of course, when my new DVD’s get here (Hurry up) I’ll be looking closely. Also, as far as Amanda and Garrison and her “Thank you very much”…I think that’s sarcasm. I don’t get the vibe that she is frightened by this guy…at least not yet…, just beyond annoyed and disgusted. That or she was brought up in a generation when manners were important, no matter what the situation. In which case she may have started to responded automatically and when she caught herself the only thing she could do was add a little back talk. 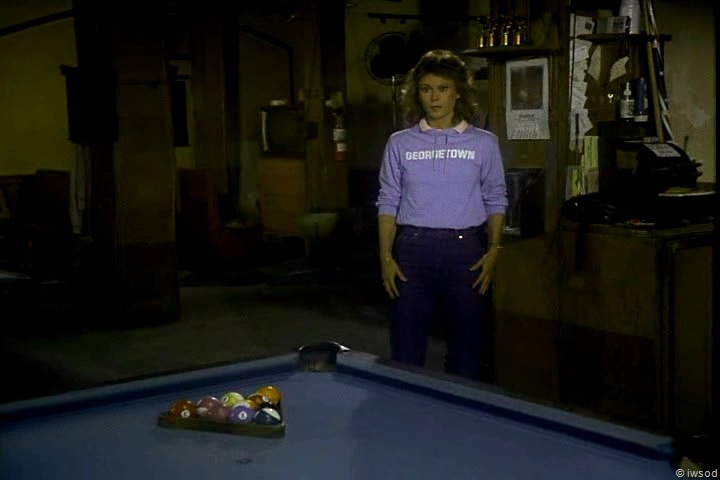 Yeah, the billiard hall scene is just plain creepy, and another reason I would put this before “Brunettes”. I also thought it out of character how Amanda just stood there for several shots (3 I think) before she decided to do something to help Lee and Emily. Yutz!!!! Yutz!!! Okay.. got it!! thanks Cindy! 🙂 I’ll edit my post so people aren’t laughing too hard at my spelling haa! Yeah!!! that was weird how Amanda just stood there! The script has her throwing more balls. I liked the script better- this is a good script!! Hiya Kristen – sounds like we view it a little differently. I did see Amanda as being afraid – but I bet lots of people don’t!! I think Amanda is the type of person who always has her manners in place – yeah.. that’ s a good way you describe it. and she also seems to always have her smile in place – she is always nice, always uses her manners.. it is very rare she isn’t nice – sometimes I feel she is too nice- she is nice in situations where it is not appropriate to be nice ( but this doesn’t mean you can’t be good – I see this as being something different) – Amanda is one of those girls who has been raised to always be Nice!